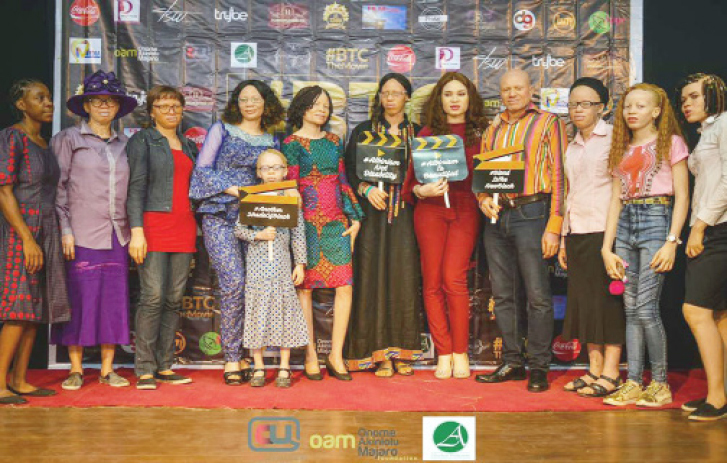 In order to tackle the stigma and discrimination associated with Albinism, Onome Akinlolu Majaro Foundation (OAM) and Ada Ossai Production weekend released a movie titled “Beyond the Complexion”, a film designed to change people’s perception about Nigerians living with albinism. The film made by Michael Azano, directed by Omokehinde and produced by Ada Ossai was an adaptation of a true life story, which tries to correct myths and misconceptions of albinism, while shedding a light on the trials and triumphs of persons living with albinism. Speaking during the premier weekend in Lagos, the producer, Ada Ossai who is also a Person With Albinism, PWA, explained that in the short film, was a true life story and fiction that showed the resilience of the Albino child when encouraged by family and the society. Ossai who noted that growing up was full of challenges as a PWA explained that albinism is a range of disorders varying in severity and caused by a reduction or absence of the pigment melanin, often causing white skin, light hair, and vision problems and has no spiritual link. Statistics available have show that the condition affects an estimated 1 in 17,000 people globally. Corroborating her views, Co- producer, Mrs. Onome Majaro noted that the specific message in the film was that albinism is a genetic condition and not witchcraft, or infidelity. “We are also using the film to create awareness and not for profit making. We are not selling it for now but we would eventually put it on YouTube,” she added.